Tompkins County’s 2017 cold season has started off with a whimper, so it’s hard to believe that the first winter carnivals are upon us, with both Trumansburg (December 2) and Ithaca (Ithaca's Ice Festival is December 7-9) celebrating theirs in early December. Winter carnivals are long-standing area traditions that celebrate the activities that come with plunging temperatures—ice skating and hockey on frozen ponds and sometimes even Cayuga Lake, sledding down great hills of snow, making snow forts and even ice sculptures, and of course enjoying seasonal comfort foods. Though ice carving had its practical uses, it has also been a festive feature of winter carnivals. The long-standing and vaunted Montreal Winter Carnival has inspired a number of regional imitators. The January 1884 carnival, for example, consisted of “ten thousand blocks of ice . . . used in the construction of the ice palaces,” reported the Ithaca Daily Journal. Read on for some noted winter carnivals that have marked the winters of seasons past in Tompkins County. From the early 1900s through the 1940s, Cornell hosted an active Winter Carnival on Beebe Lake during Junior Week. It involved ice skating and tobogganing and included ice hockey and ice skating exhibitions. 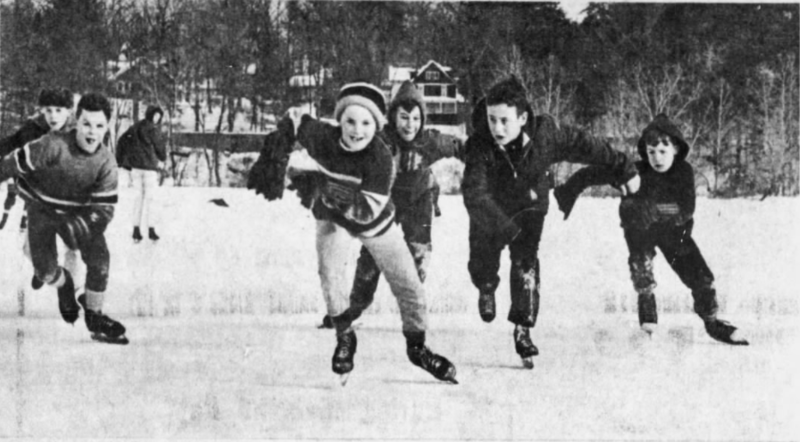 Beebe Lake skaters (above) prepare for Ithaca’s first Winter Weekend in February 1965. The festival included a roster of active winter activities, including ice skating races, a snow and ice sculpture competition, hockey games, and a figure skating exhibition. 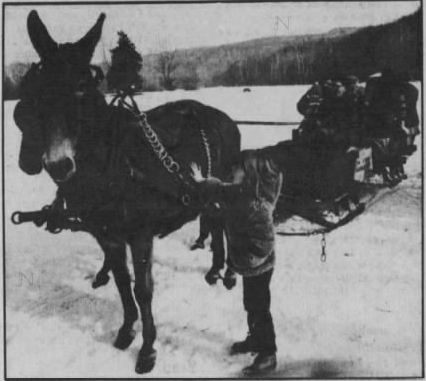 The Finger Lakes State Park sponsored an annual Winterfest in the late 1970s to 1980s at Robert H. Treman State Park. Activities included cross-country ski lessons, ice sculptures, and sleigh rides. Trumansburg’s WinterFest has been staged for 22 years. On the town’s Main Street visitors enjoy food, music, and shopping. Past festivals have offered sleigh rides, a tree-lighting ceremony, and a visit from Santa. The Groton Winterfest first took place in 2002 and included carnival fare and kids crafts. Though defunct, this mid-winter festival merged art, music, and science to shine a light on the season. It began in 2004 and even included an ice-climbing exhibition on a cliff near Vann Natta’s Dam on Six Mile Creek that year. Share your photos of winter carnivals past to include in the winter carnival gallery. Email to pat@historicithaca.org or post on Facebook @IthacaHeritage with the hashtag #WinterCarnivals.